You are here: Home / Food / Harry Potter Marshmallows – HILARIOUS Fun for All Ages! 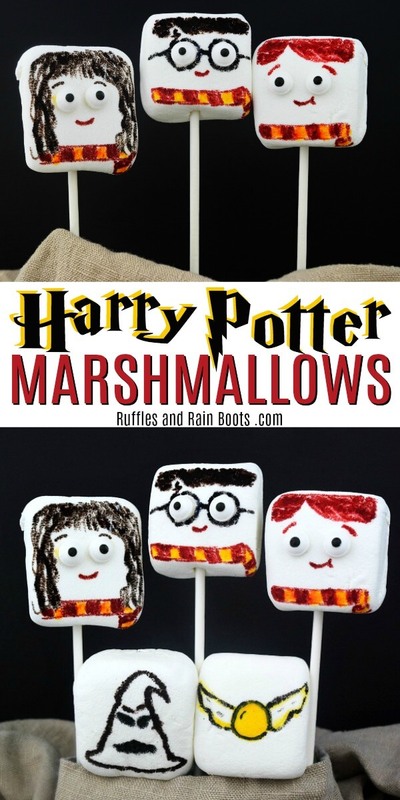 Harry Potter Marshmallows – HILARIOUS Fun for All Ages! These Harry Potter marshmallows are quick, easy, and a fun kid’s craft for a Harry Potter movie night. Join us to set up this fun Harry Potter treat! 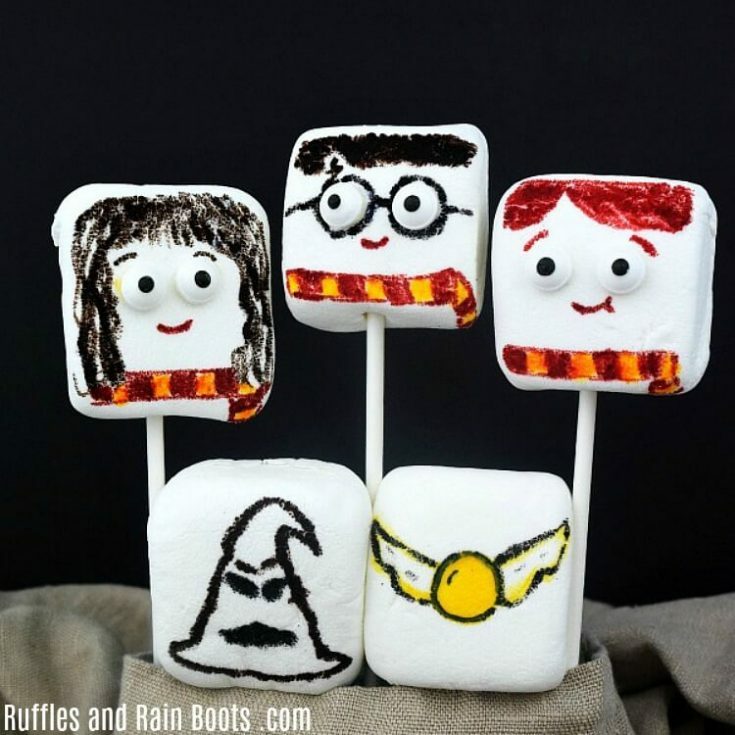 Harry Potter Marshmallows – A Fun Movie Night Treat! We love setting up themed family movie nights here on Ruffles and Rain Boots. One of my daughter’s favorites (and mine) are the Harry Potter movies. You can see all of our Harry Potter food and crafts here. I’ll tell you, this went over so well with kids of all ages! And it was ridiculously easy to set up and craft while we printed out our Harry Potter popcorn boxes. You’ll be done in minutes with this fun Harry Potter craft. We used fun S’mores square-shaped marshmallows for this Harry Potter treat, but regular ones work well, too. 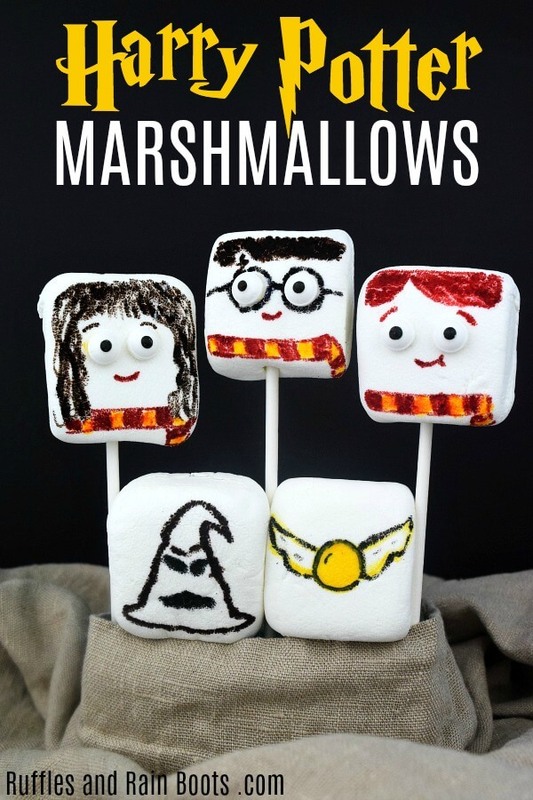 These Harry Potter marshmallows are quick, easy, and a fun kid’s craft for a Harry Potter movie night. Using the food markers, have the kids draw on their favorite Harry Potter movie characters and things they associated with it. My daughter chose Ron, Hermione, Harry, the Sorting Hat, a golden snitch, and Hedwig (not pictured – it got eaten by my 6-year-old). Melt a few of the candy melts in the microwave in 20-second intervals at 50% power. Dip a lollipop stick in the candy and insert it into the bottom of a marshmallow. 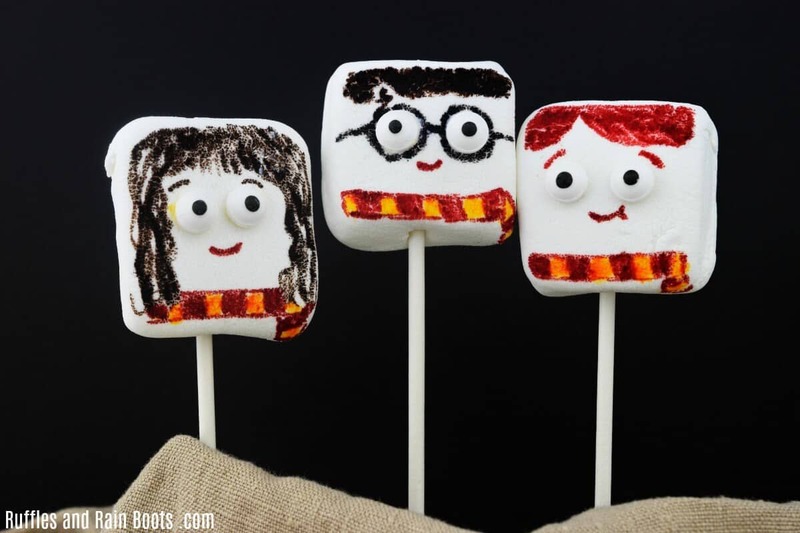 Use a small amount of melted candy to affix the candy eyes and you’re done with your fun Harry Potter marshmallows! What is your favorite Harry Potter movie? Let us know in the comments below. I just asked my daughter this question and she says it’s a tie between the first Harry Potter (the Philosopher’s Stone) and Fantastic Beasts.